: Close your eyes and think steakhouse, and you’ll know immediately what Bob’s looks like --- lots of dark wood, gleaming brass, etched glass and white tablecloths. 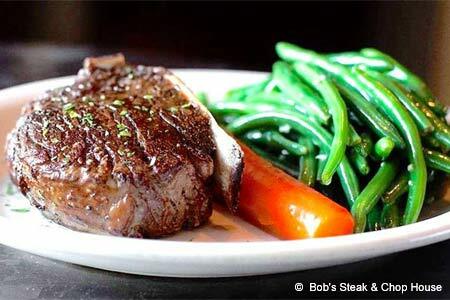 Most steakhouses charge extra for potatoes and vegetables; at Bob’s, they’re included in the price of the entrées. You’ll find standards like an awesome bone-in rib-eye, but the menu also lists pork chops and roast duck. Bob’s is justifiably renowned for its juicy rack of lamb, and you won’t go wrong with the Maryland-style crab cakes, either as an appetizer or an entrée. The best of the greens? The sophisticated asparagus salad and the hefty spinach salad. Skip the desserts and have an after-dinner Cognac in the bar instead. Bob’s is especially pretty during the holidays, and the private rooms are perfect for entertaining --- just make sure you reserve early.